#1 in Automated Video Communications. Voodoo is a one-stop source for cloud-based communications apps, strategic growth-hacking, and creative and video production services. 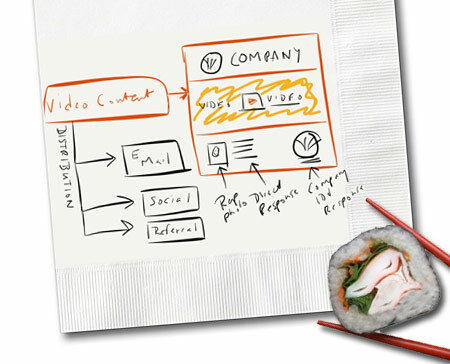 Voodoo began as sketch on a sushi bar napkin. Over lunch, marketing strategist/creative director Robert Cassard and video producer/web developer Rick Davis envisioned an automated video communications platform. Their goal was to leverage the emotional and informational impact of video and package it in a custom-branded, personalized interface. All enhancing viral pass-along opportunities. Founded in 2007, Cassard and Davis brought over 40 combined years of marketing, advertising, video production and online development experience to Voodoo. As early pioneers in video-enhanced web development, their strategic video content increased web conversion rates and generated exponential increases in eCommerce revenue for their clients. Voodoo Viral was their way of automating and replicating those results. A few of Voodoo's early adopters. Voodoo’s innovations and early success quickly attracted a round of angel investment. Cassard, Davis and the Voodoo team quickly found themselves in high demand as growth-hackers—helping companies and organizations engineer their online communications, marketing and sales approaches for rapid growth. 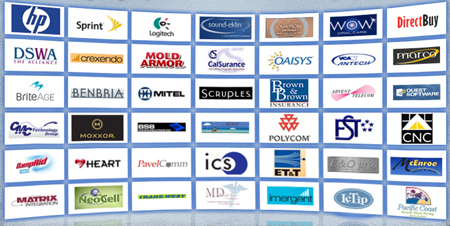 From the start, Voodoo clients spanned many sectors and included major players like Sprint, Logitech, HP and Mitel, all of whom remain on Voodoo’s client roster today. To ensure superlative customer service and results, Voodoo limits the number of customers it serves. This high-service, boutique approach contrasts starkly with other sales and marketing automation and video hosting companies. Voodoo has evolved into the leading Automated Video Communications platform. The platform undergoes constant improvement based on direct input from scores of clients. Innovative features are continually added in response to clients’ specific communications needs. 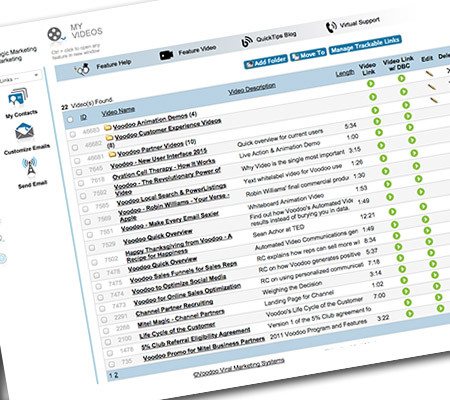 By 2012, the original platform had spawned two versions: the full-featured Voodoo Business Builder app and the foolproof eVideo Launcher, a lite system for users who don’t want or need a full set of tools. Corporate clients can use the apps individually or in combination to serve users with the exact features they need. Users can pump any kind of content through Voodoo. This includes email, texts, surveys, web pages, social media posts and more. But video remains a key differentiator and where the magical results often happen. Voodoo helps companies who might otherwise avoid video for its presumed expense and creative pitfalls get over their fear and into the fun. Once they experience the dramatic results and ROI video can generate, most companies elevate video into a top priority—giving it a central role in their business communications. Voodoo is a virtual company. Really. The team redefines freedom and independence. From the very beginning, Voodoo recognized that the best creative and coding talent isn't all in one place. So Voodoo leveraged the power of networking and telecommuting to create a de-centralized workforce. Team members and affiliated producers work from their own offices and studios or in flexible pods. They are given extraordinary autonomy and independence to work their assigned miracles when, where and how they want to. This helps them stay happy, productive and balanced. And you'll experience it when you work with them. The ability to scale the team as needed. 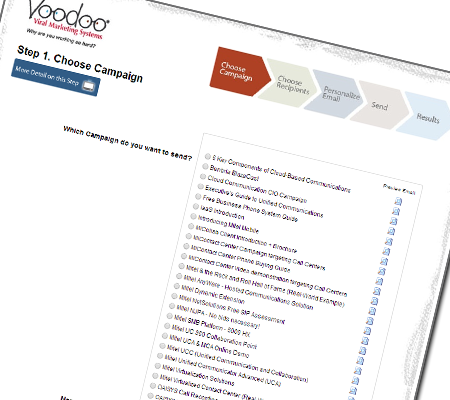 And for Voodoo customers: the best talent for the job and cost-savings passed along every day. 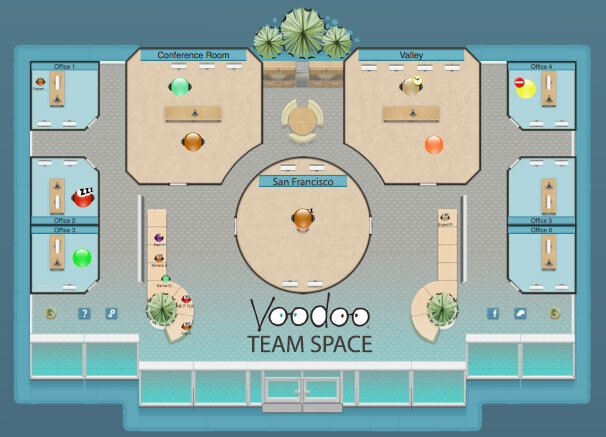 In addition to our San Francisco Bay headquarters, Voodoo has team clusters in Central California, Southern California and Phoenix with more to come. Voodoo Video Marketing’s steady organic growth attests to the effectiveness of its team approach, its innovations and its platform. With more than 9 out of 10 users expressing high satisfaction, Voodoo owes much of its growth to referrals from happy customers.